In the 1980s, while pencil and paper still dominated U.S. classrooms, Dr. Seymour Papert, one of the world’s leading educational theorists, envisioned the revolutionary potential of computers in education. Dr. Papert predicted that children and teachers would use computers as instruments for learning and enhancing innovation. It has been three decades since Dr. Papert wrote about the potential radical change in education, and his prediction seems to have come to fruition. According to the National Statistics of Education, Public schools in the United States, on average, provided at least one computer for every five students in 2013. Annually, public schools spent more than $3 billion on digital content. In addition, achieving equity of technology access and usage at school has been a priority for policy makers. Led by the federal government, the country is making a great effort to make affordable high-speed Internet and free online teaching resources available to the rural and remote schools. Moreover, during the 2015-16 school year, state standardized tests for the elementary and middle school grades were administered via computer more than by paper and pencil. All these actions are taken with the rationale that technology can improve students’ learning. However, such improvement has not always proven to be the case, as the wealth of technological resources in today’s schools are still underutilized and have failed to make a significant impact on educational practices and student learning. Access to technology devices does not necessarily lead to abundant classroom technology use by teachers and students (Cuban, Kirkpatrick, & Peck, 2001; Proctor & Marks, 2013). According to a national report, 60% of the surveyed teachers indicated that they and their students did not often use computers in the classroom during instructional time. This disconnection between access and usage in schools is slightly more common in high-poverty schools. In addition, even though technology is used in classrooms, it may not be used wisely and constructively – that is in a way that can actually improve learning and prepare students for the twenty-first century workplace. Further, academics and parents alike have expressed concerns about a number of potential problems of technology, such as digital distractions, ways in which unequal access to and use of technology might widen achievement gaps. In 2013, the Los Angeles public school system undertook a $1.3 billion effort, to give each teacher, administrator and 640,000 pupils an Apple iPad preloaded with educational software provided by publishing giant, Pearson. This program was once seen as a way to boost the city’s low-income students, who previously had limited access to digital educational tools at schools. However, the program did not achieve its original goal and soon turned into a crisis. One year after the program was initiated, the superintendent suspended the contract with Apple and Pearson, as problems had been occurring almost daily with either the technology or the curriculum. This situation even resulted in the resignation of the superintendent (see the timeline of this program here). However, Los Angeles is just one classic case of school districts getting caught up in the educational technology frenzy without fully thinking through a practical plan. Because no one wants to be the next LA Unified, an important lesson must be learned – having access to the technology devices is just the first step; technology should become an integral part of how the classroom functions. More and more policay makers and educational practitioners have agreed on the crutial role teachers plays in implementating technogloy in classroom instruction. Teachers should be viewed as the agent of technology integration. In general, most teachers have recognized the potential of technology in enhancing student’s learning, and believe that technology helps them accomplish professional and/or personal tasks more efficiently. However, they are hesitant to adopt curricular and/or instructional innovations and may even view technology as “disruptive” (Laurillard, 2008). What forms this gap between high perceived utility value of technology and low usage? The lack of relevant knowledge (Mishra & Koehler, 2006). Teacher’s knowledge, including the knowledge in technology usage and the knowledge in technology integration, has been identified as key factor determining the technology integration level (Shapka & Ferrari, 2003). Low self-efficacy in technology usage. Research has showed that teachers with lower self-efficacy scores are likely to be less-prepared to integrate technology into classrooms (Moore-Hayes, 2011). Conflicting pedagogical beliefs. Many studies suggests that belief systems influence how teachers use technology in the classroom. In general, teachers with more conservative beliefs are more likely to implement more traditional or “low-level” technology uses, whereas teachers with more constructivist beliefs are more likely to implement more student-centered or “high-level” technology uses (Roehrig, Kruse, & Kern, 2007). School/Subject culture. A previous study demonstrated that a technology innovation was less likely to be adopted by teachers if it deviated too greatly from the existing values, beliefs, and practices in the school. By constrast, changes in beliefs about technology use occurred more readily among teachers who were socialized by their peers to think positiviely about computer use (Zhao & Frank, 2003). How can those barriers be overcome? Several effective approaches have emerged from previous studies. Fortunately, we have recently witnessed a trend that more and more technological interventions are coming with a package of rigorous teacher training, demonstrating an increasing national recognition for the importance of teacher technology professional development. Plus, more and more States are now requiring teacher’s technology skill training in order to acquire the teaching certificate. This enhanced professional development, in general, has demonstrated satisfactory results for both the teachers and students. Studies have reported that teachers tend to have positive attitudes and higher confidence toward technology integration, and students benefit more from the classroom technology, as a result of providing teachers with such professional development. Several best practices of professional development have been identified by Lawless and Pellegrino, such as activities being tailored to individual teachers’ needs, the settings in which the teachers serve, as well as the school’s overall vision for change and administration (Lawless & Pellegrino, 2007). Regular professional development is important, but not enough. Teachers need daily support from their fellow colleagues in the same community. In an article on technology integration, Macdonald (2008) wrote that “to effect lasting educational change”, collaboration for teachers needs to be facilitated in “authentic teacher contexts”. Teachers not only share their knowledge, but also share their emotions, especially the common frustration in implementing technology in the classroom. Technical support is another factor that influences technology use (Lim & Khine, 2006). Technical problems make it difficult to use technology in classrooms, and slow network performance and inadequate computers are an obstacle to using technology in education (Pelgrum, 2001). In a qualitative study, Warschauer and colleagues recognized the crucial role of technology support in improving teacher’s technology integration (Warschauer, Knobel, & Stone, 2004). Let us consider a school that has implemented technology into classroom instruction successfully, has a broad-based technology committee and a full-time media specialist. This school must have made a conscious decision to free up specialists within the teaching staff to provide technical and pedagogical support to other teachers, and students have been recruited for maintenance, installation, and other technology-related work as well. When Salisbury Township School District in Pennsylvania started its 1-to-1 laptop initiative named Teaching and Learning 2020 (TL2020) for grades K-12 in 2011, they designed a series of technology trainings for all teachers in the district for four years. Much of the training focused on progressive concepts, such as learning to support each individual student’s needs, as opposed to directing them; maintaining student engagement in learning; and creating activities that integrate technologies into the existing curriculum. Four actions have been taken by the district to maximize the effectiveness of their teacher training program: aligning professional development (PD) goals with 1:1 program goals; hiring technological support personals; personalizing the PD program through differentiation and choice; and evaluating PD efforts to meet developing needs. Even though the final results have not been revealed, as the initiative is still on-going, we can still foresee the potential of the program to cause substantial changes in teachers’ knowledge, beliefs, and culture regarding technology integration. Once the teachers’ mindsets have changed to include the idea that teaching is not effective without the appropriate use of technology resources to achieve student learning outcomes, and once they are equipped with knowledge to use technology wisely, our education will have reached a significant milestone. The most recent encouraging news is that Salisbury School District was awarded the No. 2 spot on the 2014-15 Digital School Districts Survey for communities with student populations of 3,000 or less, which is released annually by The Center for Digital Education and the National School Boards Association. Laurillard, D. (2008). The teacher as action researcher: Using technology to capture pedagogic form. Studies in Higher education, 33(2), 139-154. Lawless, K. A., & Pellegrino, J. W. (2007). Professional development in integrating technology into teaching and learning: Knowns, unknowns, and ways to pursue better questions and answers. Review of Educational Research, 77(4), 575-614. Lim, C. P., & Khine, M. S. (2006). Managing teachers’ barriers to ICT integration in Singapore schools. Journal of technology and Teacher Education, 14(1), 97. MacDonald, R. J. (2008). Professional development for information communication technology integration: Identifying and supporting a community of practice through design-based research. Journal of Research on Technology in Education, 40(4), 429-445. Mishra, P., & Koehler, M. J. (2006). Technological pedagogical content knowledge: A framework for teacher knowledge. Teachers college record, 108(6), 1017. Moore-Hayes, C. (2011). Technology integration preparedness and its influence on teacher-efficacy. Canadian Journal of Learning and Technology/La revue canadienne de l’apprentissage et de la technologie, 37(3). Pelgrum, W. J. (2001). Obstacles to the integration of ICT in education: results from a worldwide educational assessment. Computers & Education, 37(2), 163-178. Proctor, M. D., & Marks, Y. (2013). A survey of exemplar teachers’ perceptions, use, and access of computer-based games and technology for classroom instruction. Computers & Education, 62, 171-180. Roehrig, G. H., Kruse, R. A., & Kern, A. (2007). Teacher and school characteristics and their influence on curriculum implementation. Journal of Research in Science Teaching, 44(7), 883-907. Shapka, J. D., & Ferrari, M. (2003). Computer-related attitudes and actions of teacher candidates. Computers in Human Behavior, 19(3), 319-334. Warschauer, M., Knobel, M., & Stone, L. (2004). Technology and equity in schooling: Deconstructing the digital divide. Educational Policy, 18(4), 562-588. Zhao, Y., & Frank, K. A. (2003). Factors affecting technology uses in schools: An ecological perspective. American Educational Research Journal, 40(4), 807-840. An exciting story was posted on the University of California, Irvine news blog related to a recent grant received by Dr. Connor! This grant will allow the ISI lab to continue their work on the ongoing Word Knowledge e-Book (WKe-Book) project. The goal of WKe-Book is to improve students’ comprehension monitoring, strategy use, word knowledge, and word knowledge calibration. This project will also allow the ISI to expand the e-Book library into additional topic areas, such as science and social studies. You can read more about the WKe-Book here. This blog series, under the direction of Dr. Carol Connor, presents research on problems and actionable solutions for diverse classrooms and learners. 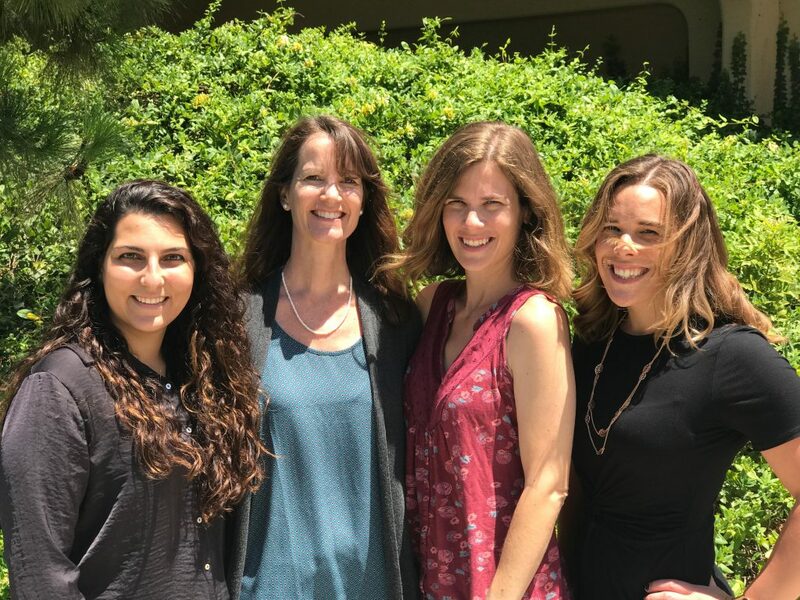 The editorial team consists of doctoral students in the iSi lab: Elham Zargar, Karen Taylor, Taffeta Wood, and Masha Jones. Teachers and Researchers share common goals and common problems. One area of concern for both is elementary school students’ literacy. According to NAEP, only 36% of U.S. students are performing at or above a proficient level of reading by fourth grade. This is especially concerning given that students who struggle with reading are more likely to experience long-term negative consequences including limited employment opportunities and higher rates of incarceration (National Center for Education Statistics, 2009). Many students fail to attain proficient literacy skills because they do not receive the type and amount of instruction needed to meet their potential. One size does not fit all, especially for literacy instruction (Connor et al., 2009; Taylor, Roehrig, Hensler, Connor, & Schatscheneider, 2010). Educational researchers know that our labs are full of solutions and our schools are filled with challenges. Teachers know that their jobs are important and often difficult. So let’s consider how we can solve the problems of student failure by closing another important achievement gap: the gap between research and classroom practice. Through successful teacher-researcher partnerships, we may hope to take what we know and change the way things that are not being learned, are taught. Here we will look at this kind of possibility in the context of a reflection on a particular research-school partnership from 2015-2016. I came to this study as a new researcher. Being fresh from my former position as a first grade classroom teacher in a title one school, I had an interesting first-hand look at how researchers look at teachers, and how teachers look back. Why Isn’t This Fixed Yet? I can vouch for the fact that even schools with challenges are full of people who care a lot. Unfortunately, this doesn’t always mean much for the children the teachers are responsible for teaching. That is to say, if caring alone solved the literacy crisis in the United States our teachers could solve it in one of the many weekends they spend working and planning. But teaching and learning turns out to be a complicated endeavor that you can’t just feel your way through. Best practice, not longer hours of blood sweat and tears, are what we need in schools. This is why education research focuses, not just on understanding students or teachers or schools, but also on interventions and finding out how student learning can be maximized. We don’t want to just ring our hands about problems or blame parents and students; we want to our students to succeed. This won’t happen unless change happens in classrooms. In order to take what research knows and implement it in our schools, I propose that what we need to do is to strategically plan, do, study, and act in schools where change is needed and our presence is welcome. (Yes, this is a PDSA cycle of improvement science, which, I will expand upon a bit more later.) But if you simply can’t wait; visit the Carnegie Foundation. As a researcher I worked on a large-scale efficacy trial of a web-based technology called A2i (Assessment to instruction). A2i is a support technology for teachers to help them personalize literacy instruction to maximize students’ learning. It uses patented algorithms to give teachers the amounts and types of literacy instruction each of their students needs. For example, some students need more work on code-focused learning like phonics, and some students need more help with meaning-focused learning like comprehension. We knew from nine years of previous studies that A2i worked to ensure students literacy gains when teachers used the technology to plan personalized instruction. You can see more about A2i here. Within a Design Based Implementation Research (DBIR) framework, we worked with schools to develop the A2i technology, the recommendations, the assessments and the professional development (PD) in an iterative process. Like all partnerships, our DBIR partnership had its own unique joys and sorrows. To better understand DBIR you can visit this site. One of the joys, as any scientist will tell you, is that our hypothesis was supported (what we thought would happened did indeed). We found that our professional development (PD) mattered. That is, teachers who rated higher in PD “take up”— (or buy-in including teacher participation in PD, teacher’s comfort with technology, teacher’s willingness to schedule in class PD, teacher’s willingness to meet one-on-one with researchers for support, teacher’s willingness to learn how to use A2i) used A2i more. In turn, students whose teachers used A2i for more time generally made bigger literacy gains. One of the things we know from our previous studies is that the more teachers used A2i, the more they individualized (or personalized) instruction in the classroom. That’s all very well and good; the question, however, is how do we take this information, study it and act with other schools to improve the teacher take-up? How do we bridge the gap between research and practice in schools? How do we just… fix it? Yes, teachers who had better PD take-up used A2i more but, knowing that PD and PD take-up matter, how do we get more reluctant teachers to engage and act? This is where I would like to go back to the idea of improvement science. 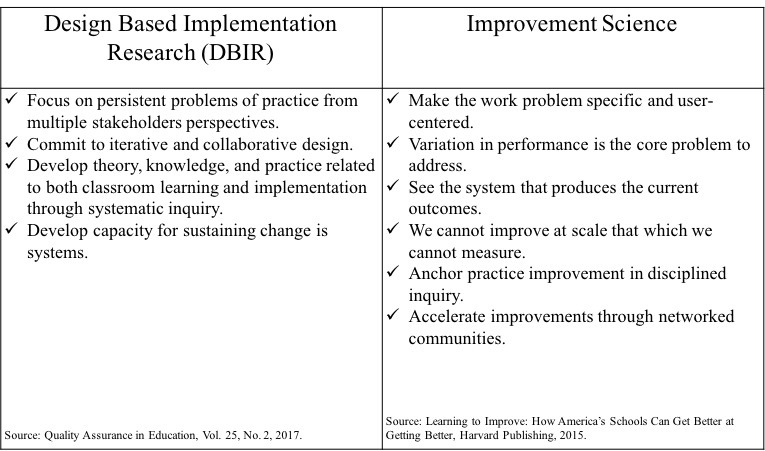 You’ll notice that I am talking about both DBIR and improvement science in the same blog. I do so purposefully for two reasons. 1) Because they are both useful and, just as teachers and researchers, they have similar goals and challenges. So let’s all just get along, shall we? Somebody think of the children! And 2) No framework has all the answers and it may behoove both practitioners (teachers) and researchers to remember that the answers to complex challenges may be to use a combination the most effective methods and approaches. In the improvement science framework of getting better at getting better, let us plan, do, study and act. As we partner with schools we should consider which teachers had better take up and which didn’t. In studying our results, I can see that we had some teachers that had issues with A2i’s recommendations for their students. We had other teachers who simply felt overwhelmed with the district’s various demands on their time and with reaching those goals. The problem here is not realizing that our common goal is their common goal: children’s literacy. And this, this is a lesson from the DBIR framework, commitment to a common goal. Let’s look at what happened in a particular case. One teacher, who refused to use A2i during months of district testing, makes me wonder, might her students have done better on the state tests if she were personalizing literacy instruction daily in order to better ensure student literacy growth? I propose that, yes, indeed, this would have helped her students. Although we pointed this out to her on various occasions, she was absolutely certain that our way to the goal was not as good as her way to the goal. Remember that as researchers, our partners can refuse and/or withdraw during the course of a study. We must walk the fine line of advocacy for students that are not ultimately ours, and respect for the interventions we know will serve those students. So perhaps the lesson from this teacher is that we needed to provide her with better irrefutable evidence that the A2i and personalizing instruction would, and was working, for her particular students, and that the skills that the recommended learning opportunities would improve would align to her district tests. This proved difficult as she was barely using the ISI framework or A2i, and did not want us in her room. Clearly, we don’t want to be stymied like this in future. So how do we take this and study it in order to act. Reflecting with this teacher herself makes sense. I would like to interview her and really get a picture of what it would have taken to convince her. Perhaps if we could have run small groups in her room and shown her the growth of her students when they were receiving personalized literacy instruction that matched the A2i’s personalizing literacy instruction recommendations she could have been convinced. But we could not get her consent to run groups. To get there, it’s possible that demonstrating our appreciation of her challenges through a research partnership event at our university to kick the year off. Even though we had the support of the principal, the take-away here is, take care of your relationships with a teachers and educational leaders, provide as much evidence as you can, and ask, ask, ask what teachers are thinking/feeling/not believing and work to close that gap. Have a committed team in the spirit of DBIR (Let’s remember that we all set out on this path for the same reason (Fishman, et al, 2009) and this same reason is students’ academic achievement. Deliver a real solution (Because, they won’t do what we are asking if they think we are asking them to not get to the goal — Children’s literacy) In this case we surely had a program that works when implemented (Connor et al., 2009). Design iteratively and as a partner with schools as DBIR recommends and use the improvement science cycle of plan, do, study and act (Bryk, Gomez, Grunow, & LeMahieu, 2015) to more accurately define our plan of action and where we are in the process in order to get better at getting better more efficiently and purposefully in order to effect change and in the spirit of DBIR, produce original analysis. Outlining these recommendations, I find myself re-reading them and asking myself: To what extend did we do these things, and how can we better follow these recommendations with A2i in the future, as it rolls out as a product through a social benefit corporation [hyperlink (learningovations.com)]? That is, as we move from research to even larger scale implementation, how do we continue to close the gap of what research knows is best practice and business as usual in literacy classrooms? We had a committed research team and we had, for the most part committed teachers, but in future we need to all understand how the common goal of literacy for all students can best be met. The real solution will be teachers using research-based solutions. Finally, in classrooms where researchers are working with teachers, we must push ourselves to be constantly planning, doing, studying and acting in a cycle that quickly makes note of issues, outcomes, and changes that must be swiftly made to create a cohesive team of teachers and researchers. The role of researcher is both expert and support staff, with teachers at the center as co-experts. Still, we must better inform and illustrate for teachers the benefits of our research and their real world applications for their students. By doing so, we can move as partners towards closing the many gaps that remain when we look at each other from different sides. Bryk, A. S., Gomez, L. M., Grunow, A., & LeMahieu, P. G. (2015). Learning to Improve: How America’s Schools Can Get Better at Getting Better. Harvard Education Press. 8 Story Street First Floor, Cambridge, MA 02138. Connor, C. M., Piasta, S. B., Fishman, B., Glasney, S., Schatschneider, C., Crowe, E., … & Morrison, F. J. (2009). Individualizing student instruction precisely: Effects of child by instruction interactions on first graders’ literacy development. Child development, 80(1), 77. Fishman, B. J., Penuel, W. R., Allen, A. R., Cheng, B. H., & Sabelli, N. (2013). Design-based implementation research: An emerging model for transforming the relationship of research and practice. National Society for the Study of Education, 112(2), 136-156. NAEP. (2005). The nation’s report card. Washington DC: National Center for Education Statistics. NAEP. (2009). The nation’s report card. Washington DC: National Center for Education Statistics. Taylor, J., Roehrig, A. D., Hensler, B. S., Connor, C. M., & Schatschneider, C. (2010). Teacher quality moderates the genetic effects on early reading. Science, 328(5977), 512-514.